Getting toddlers and preschoolers to sleep at night can be a real test of wills. While some children set into a sleep routine quickly and easily, getting siblings close in age - or twins, triplets (and more) to sleep at night can become a test of patience and creativity for many parents. It seems that once we get them to sleep through the night as infants, “something” always seems to happen – growth spurt, teething, colds, to name a few – that throws the sleeping schedule off. Are they taking naps during the day? If so, shorten it to an hour and a half and make sure they’re up by 3:00 p.m. If they already a short nap and are up by 3, try to eliminate naptime altogether. I found that by eliminating a nap one afternoon, bedtime is much easier for that night, and they go down for naptime much easier for the next couple of days. No TV, computers, or video games from one hour before bedtime – images stimulate toddlers minds and can make them go ‘bonkers’ or hyper. Keep ‘screen’ time to a minimum during the day as well. Eliminate processed sugars – no juices, chocolate milk, candies, cookies, graham crackers, peanut butter, mac & cheese, high processed foods, etc., etc., after 4:00 p.m. Watch the sugar intake during the day as well – read labels, it’s amazing how much sugar is hidden in some products. For instance, some yogurts have 32 grams of sugar. Make sure your toddlers and preschoolers are eating a balanced diet, especially getting enough vegetables – focus on the green ones, and especially broccoli. Many parents complain that their kids don’t ‘like’ vegetables – try raw vegetables with a side of ranch, add vegetables to quesadillas, pizza, and spaghetti. Are they having a bedtime snack? Full bellies tend to make for sleepy toddlers and preschoolers, especially during growth spurts. A low-fat, low-sugar, low-carb cracker (yes, there are such things) with cheese tends to be a great filler. Popcorn is another quick and easy bedtime snack. Is your naptime and bedtime routine really REALLY consistent. Same time every day, same routine . . . if you’re constantly consistent for four days, but change it for the fifth, or if Friday and Saturday night are always different - THEY KNOW that the routine isn’t really a routine and they’ll test you. Same bath time, same story time, same bedtime, same snack time, same routine – not forever, but definitely until you get this solved. Have at least a half hour before bath time that is quiet time – no TV, no rowdy play, no loud/active music (classical music actually works great), lights low, then bath, then ½ hour of story time. Get your toddlers and preschoolers up every morning at the same time every day. No sleeping in until 9 just because they were up until 10. Exercise them to exhaustion during the day. Okay, maybe not that much, but if they expend all their energy during the day, they’ll sleep at night. Summer is a great time to go to fairs, festivals, car shows, parks, and farmer’s markets are all great places to go to walk toddlers and preschoolers to expend that energy. Check with your local Boys & Girls Clubs and City’s Recreation Department to see if there are programs available for your active toddlers and preschoolers. Our local Boys & Girls club has a coop activity center during the school year that allows the boys to play with a variety of toys – in a full-sized gym. Our City Rec program offers swimming lessons, gymnastics, t-ball and other activities that are SUPERVISED by others (which lets me bring a book), and are low-cost, with discounts available for multiples. If Mom is usually the one that puts the kids to bed and then is the same person who puts them back to bed and/or disciplines them when they get up – have Dad put them to bed. Actually, even if you both do it, have Dad do it – unless he’s a pushover. We’re genetically predisposed to not take Mom as seriously as Dad – Mom’s are usually the more nurturing parent, and kids know that. You can paddle bottoms, take away privileges, or give time outs all day sometimes, and it doesn’t ‘get through’ because your toddler(s) have made up their minds that MOM are the ‘nurturing one’ and will eventually cave. A few months ago we went through a boundary-testing period where the guys started the ‘delay of bedtime’ – need water, go potty, another story – after night three, Dad put them to bed for two nights, and problem solved. Make sure you’re spending ‘one on one’ time with your twins and toddlers. Sometimes the reluctance to go to sleep might be a call to spend time with Mom and/or Dad, especially after busy days. Include cuddle time as part of the bedtime routine. You might also spend family meals talking to your toddlers and preschoolers so that they feel they have your attention and focus – and they won’t have to compensate at bedtime. What’s it like in their room? Is it a good sleep environment? Are toys picked up, beds made? It sounds simple, but clean, clutter free rooms can have a dramatic impact on sleep. Also, is there a light that shines into their room? We found out when we moved their bed that when the guys’ door is open, and the hall light on, the reflection shines right onto their pillows. Is their room near a street that might be too loud, or a street light that might be bright? Simple environmental factors can have a big impact. What’s the house like after they go to bed? Is it quiet – or does it sound like there’s something going on (a movie, for instance) that sounds more fun than sleeping? I had a friend whose twins’ bedroom was on the other side of the living room. After lights out was Mom and Dad’s time to watch a movie. The problem was, the sounds of the movie were keeping the kids up. My friends lowered the volume, and problem was solved. Take away privileges, and give rewards. If there is a toy they insist on playing with when “lights out”, take it away. Tell them they can have it the next night if they can behave tonight. Make pancakes (or another breakfast treat) in the mornings when they go to bed on time, and stay in bed. Or go do something fun the next morning. Make sure they are told that if they don’t go to sleep you won’t be able to go to the park tomorrow. 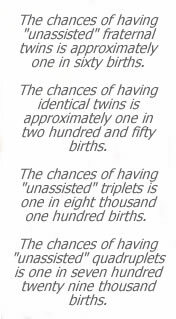 If you have twins or triplets – reward the others if only one misbehaves. Even if it means one goes to the park, and the other stays home. It doesn’t take long for toddlers to understand the concept of ‘cause and effect’, which is also a good life lesson. When it comes to getting twin toddlers and preschoolers to sleep, sometimes you need to look at the problem differently for a solution, not just trying to pound away trying to make a solution that doesn’t work work. Look beyond the testing of boundaries and trying of wills to see if there is something there that you can change to make bedtime easier. Disciplining strong-willed toddlers and preschoolers for an hour is NOT going to work, is not productive, and is going to cost you time, and probably sleep. You just need to be creative and find a different tactic! Don’t worry too much – giving us toddlers, I think, is God’s way of expanding our parental problem solving skills.